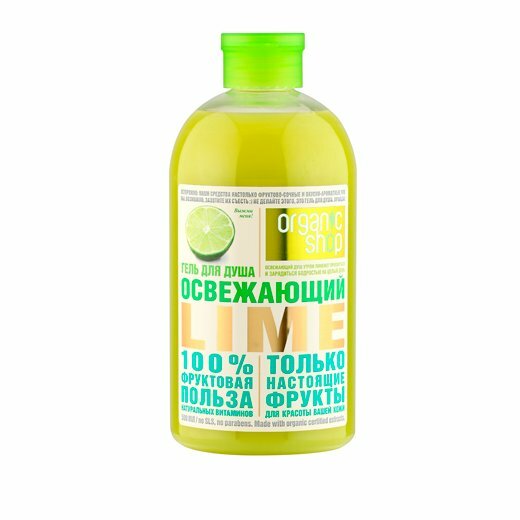 Refreshing Lime Shower Gel is produced by the Russian brand Organic Shop for its Organic Shop Fruits line. It gently cleanses the skin without drying it out. The product has a juicy scent that helps to wake up and gives you a powerful mood boost. Free of SLS and parabens. This refreshing shower gel is formulated with certified organic ingredients that help to keep your skin healthy and conditioned. Organic lime extract helps to improve skin elasticity, stimulates microcirculation in the epidermis, provides a rejuvenating effect, and helps to cleanse your skin gently yet thoroughly. Organic peppermint extract has a refreshing and toning effect. It helps to normalise sebum secretion, stimulates skin cell metabolism, soothes and softens the skin, and prevents acne due to its anti-inflammatory effect. Organic sugar cane extract helps to tighten pores, provides a moisturising effect, makes your skin supple and silky smooth. Directions. Apply a small amount of gel onto wet skin, lather, rinse. Ingredients. Aqua with Infusions of Organic Citrus Aurantifolia Fruit Extract, Organic Mentha Piperita Leaf Extract, Organic Saccharum Officinarum Extract, Sodium Coco-Sulfate, Lauryl Glucoside, Cocamidopropyl Betaine, Glycerin, Polyquaternium-7, Sodium Chloride, Parfum, Styrene/Acrylates Copolymer, Citric Acid, Kathon, CI 19140, CI 42090, CI 15985, Limonene, Hexyl Cinnamal, Linalool, Amyl Cinnamal. Want to buy Refreshing Lime Shower Gel? Call us or submit your order via our web site! Organic Shop Fruits is a cosmetic line produced by the Russian company OOO ORGANIC SHOP RUS known for its numerous cosmetic brands. This line is based on certified organic extracts and oils derived from different fruits. Its products are free of SLS and parabens. Organic Shop is one of the leading manufacturers of natural and organic cosmetics in Russia and neighbouring countries. Its brands include Body Desserts, Organic Naturally Professional, Organic Shop Fruits, Colours of Beauty, and Organic Kitchen. Having started as a distributor, the company now focuses on creating its own products. All products branded as Organic Shop are made according to the company’s main principle reflected in its motto – “Simple, Pure, Natural”. It means that they are based on simple recipes and contain only pure and natural ingredients. Organic Shop Fruits is one of the brand’s latest product lines. It includes a variety of body and hair care products, such as shower gels, body scrubs, bath foam, shampoos, hair conditioners, and hair masks. The series comprises high-quality products formulated with fruit extracts. They are noted for their delicate texture and fresh, fruity scent.